In retrospect, this becomes a kind of manifesto of Godard's long, episodic and tumultuous output. His epic Historie(s) du Cinema (1988-98) perhaps reveals this relationship between thinking and film more explicitly than anything else. But it's also there from the start. The presence of philosopher Bruce Parain in Vivre sa Vie (1962) attests to Godard's desire to “try to film a thought in action”. Cinema, Godard maintained, altered the way we thought in the 20th century, and in turn, the 20th century shaped how we thought about cinema. I'm here to construct a 'tour' for the enjoyment - or bewilderment - of you, the future viewers and readers. 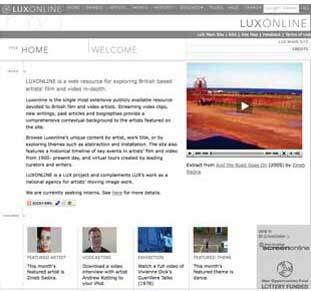 As I do so, I'm thinking about thinking and what it means to think today, while I manoeuvre through the Luxonline site. Some of you may have noticed that there has been a resurgence in storytelling and fiction in contemporary art, where both words and images are put into play. A generation of artists - many born in the early to late 70s - are evidence of new trajectories of thought powered by search engines like Google, and, especially, Google Images. Associations between things alike and unalike can be summoned up in an instant; our ignorance about a subject can be quashed by the press of a button. The depth and shallowness of the web increasingly mirrors our own knowledge databases. That's what the internet is and what it does to us: we input something precise to look for and are thrown a promiscuous list or index or matrix of possible matches. Part of the impulse behind mechanization is that we create machines that do things on our behalf. The internet stores everything we think we might want to know on behalf of us. Search engines use inscrutable mathematics to bear the resemblance of qualitative associative thinking. In the 21st century, we have now outsourced not only our amnesia to search engines, but also in return, the visual manner in which search engines display information advances how it is we now think. If, then, at the cinema “we do not think, we are thought”, what are we when we are on Safari or Mozilla or Explorer? And, even further, what are we when we are watching film online, not in the shielded preserve of Siegfried Kracauer's darkened cinema, but in the continuum of the rest of the world around us? So, with these notions in mind, I rummaged through Luxonline, driven by a desire to re-know what I already thought I knew which often leads to new things I don't know about. This is the aleatoric beauty of a digital archive: it bears the diagram of an imagination you can begin to possess. The result? New thoughts on old things.